Carl Bellows of Temple, Texas was taken to the hospital during an “Open Carry Texas” demonstration on Thursday afternoon after almost completely severing his foot when he accidentally discharged his AK-47. Bellows was reportedly standing with another member of the Open Carry Texas movement during the rally, and they were both “talking excitedly, and [Bellows] was jumping up and down – really getting pumped up” said a witness to the accident. 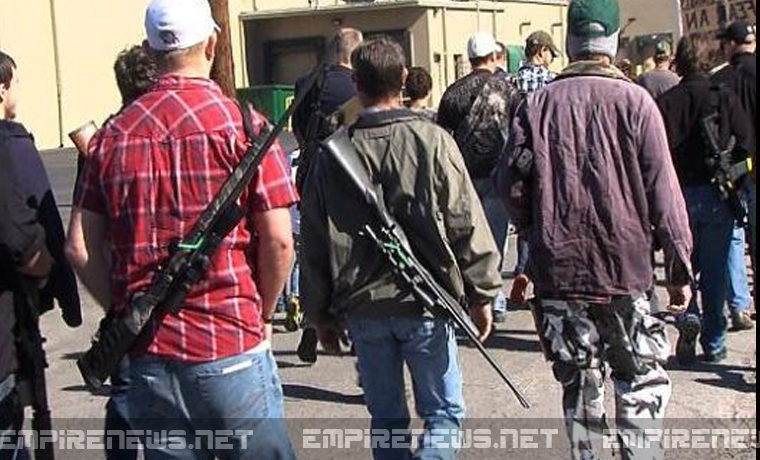 Open Carry Texas aimed their sights back at the NRA recently in a Facebook post, saying that the NRA doesn’t really know what their group even stands for. “The NRA has refused to learn for themselves how Open Carry Texas conducts itself other than what the liberal media and Bloomberg-funded gun control extremists have falsely portrayed.” Said the OCT in their post. Bellows and his foot are not the first major casualties of the OCT’s war on showing off their weaponry. Recently several restaurant chains in Texas have placed restrictions on firearms being brought into their locations, including Sonic, Chipotle, Chili’s, Starbucks, Wendy’s, Jack in the Box, and Applebee’s. At the time of this writing, no charges were being brought against Bellows for discharging his weapon in public, although police have said they will be looking into the legality and registration on all of his guns.